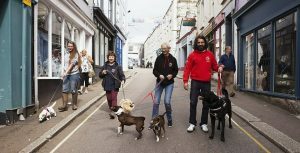 STRUTTING THEIR STUFF in Falmouth are, from left to right, tiny Jack Russell Mamie, regal Teddy Pom Pom, little mixed breed sisters Coco and Bailey, and biiiig-and very lively-Ollie the Collie/Lab(also known as ASBO)! All of them are still hoping to find their forever homes. The dogs were part of our photocall at The Salon, in preparation for Kez’ Hair for the Dogs challenge. The winning style will be happening at The Salon on Wednesday, 6th June-so get voting! Remember each vote costs £2. You can vote as many times as you like, and for as many styles as you like.